Award-winning poet Susan Gillis was one of three featured readers on April 19 at The Moka House on Hillside. “It’s good to be back in Victoria,” said Susan Gillis stepping on stage, “to revisit old friends, places and plants I’ve left behind.” The former resident of Victoria now lives in Montreal and balances a busy schedule of teaching, writing and touring. Susan took time to thank host Yvonne Blomer, Artistic Director of the weekly reading series Planet Earth Poetry, as well as her publishers Brick Books and Gaspereau Press. Then Susan read several poems from The Rapids (Brick Books, 2012), a carefully-crafted collection of 98 poems in four sections. One of the sections: Twenty-two Views of the Lachine Rapids was published as a chapbook by Gaspereau Press in 2012. The artist was inspired by the arresting imagery and “Japanese connection” in the chapbook. Pfeiffer created an original set of watercolour paintings to accompany Twenty-two Views of the Lachine Rapids. Four of these marvellous artworks are presented with the companion poems in the webpage. Pfeiffer’s main gallery is in Tokyo and his paintings have a distinct oriental sensibility. He explains his attraction to the project by saying: “Susan paints poetry and my artwork is strongly influenced by literature. In this way we both drink from the same well.” He uses a combination of techniques to create his watercolour paintings. His linework is free and expressive, complimenting the wet-on-wet painterly washes and structural elements gracing works like “View with Umbrellas” (see below). “Her Surging Brow” by Klaus Pfeiffer, watercolour, 5.5 x 8.5 inches. The Lachine Rapids are located in the Saint Lawrence River near Montreal and are about three miles in length. Photo: Norman Rae. The rapid's large standing waves generate visual drama in the river and dangerous conditions for maritime travel. This situation greatly affected the founding of Montreal. A canal bypassing the rapids was built in the 1820’s. For Susan, the rapids represent overwhelming obstacles and perplexing events we encounter in our lives. We must figure a way around these obstacles, she explains, but step one is recognizing our dramatically altered circumstances. attention to the broad shoulders, the well-cut coat, the horn-tipped string at his collar. what we take for swans. “The Unusual Seven-eights View” by Klaus Pfeiffer, watercolour, 5.5 x 8.5 inches. 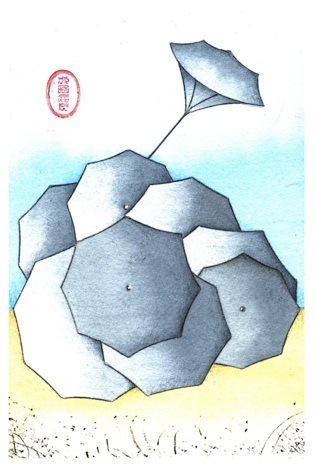 “Huddled Under Umbrellas” by Klaus Pfeiffer, watercolour, 5.5 x 8.5 inches. so low nothing has dimension anymore? slipping smoke-like underneath the door. so I went down to the rapids. It was not a bright morning. was frilled like a doily, and seethed. pricked and lifted by windhooks. Mist puffing up, the sky black then white. collapsed in the froth of its lashing. say “maelstrom.” I wanted out. I wanted time to turn back. shore, the islands, the mist and smoke. The gaps among things had closed. When I leave, understand, I will not be gone. “The Twig was Helpless” by Klaus Pfeiffer, watercolour, 5.5 x 8.5 inches. Susan appreciates the visual representations of the poems provided by Klaus Pfeiffer. The prolonged act of looking is the thematic link in the series Twenty-two Views of the Lachine Rapids. The poet poses a question: Is it possible to create a discipline from visual recording? Does long and careful observation render landscape more porous and open to interpretation, revealing its secrets, histories and connections? Can you be instructed to “go back to bed” by the mysterious forces that enliven and articulate the physical world? It appears so. Susan teaches English at John Abbott college in Montreal. During the academic year, she devotes one precious hour each morning to creative writing. “This sets me up for the day ahead,” she says. In the summer months, while living in the countryside with husband and writer John Steffler, she lingers longer in a dreamy state. “Eventually, I gather pen and paper and move to my desk,” she says. Susan relishes the kinetic energy of pen moving across paper, putting down words. She is adaptable and can write anywhere. Stimulated by nomadic wanderings in Greece, Turkey and Europe she savours the creative insights found in new locales. With her inquiring mind and finely-tuned radar, the poet scans each new situation, conjuring images out of silence onto the waiting page. Brick Books for tour assistance. 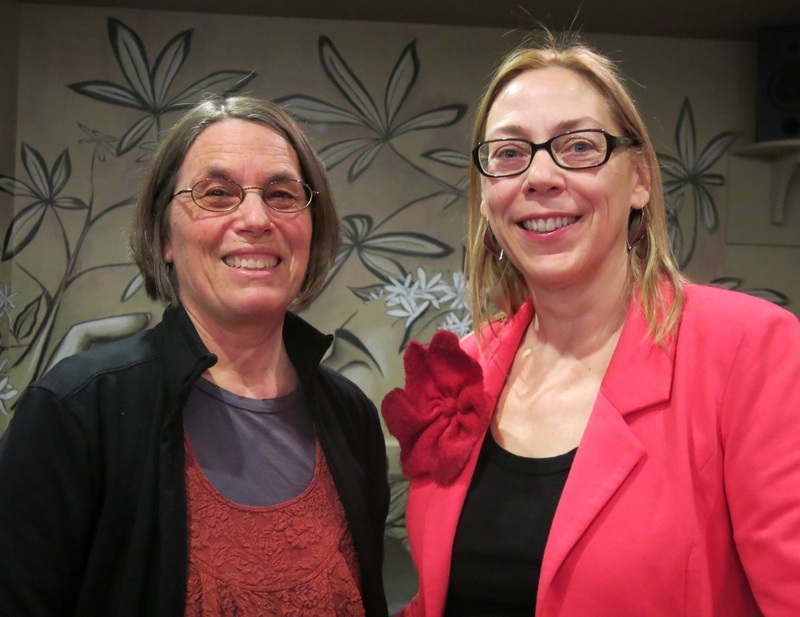 Kate Cino with Susan Gillis at The Moka House, April 19, 2013.